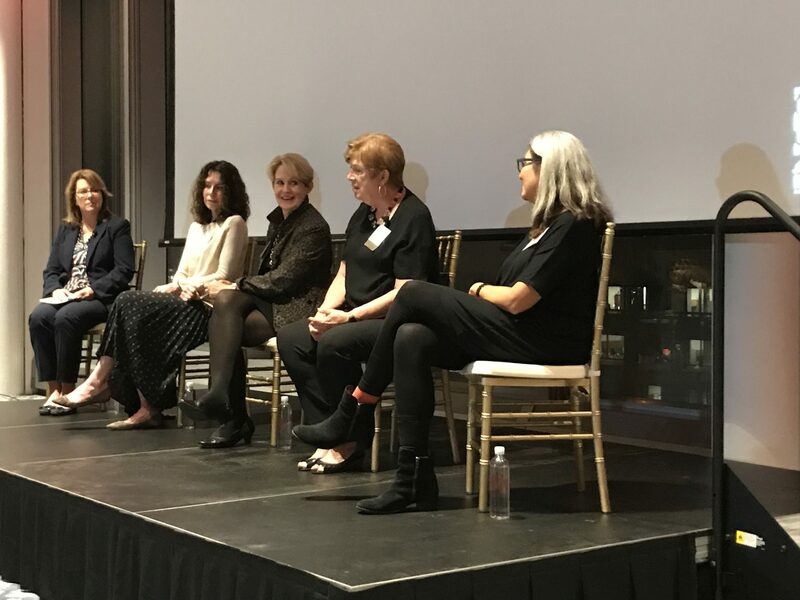 The third annual “Mother, Daughter, Sister, Spy” panel was held Wednesday evening, October 10, at the International Spy Museum’s new home at L’Enfant Plaza in Washington, D.C. The event, co-sponsored by the AMU Doctoral Studies Program, drew approximately 180 attendees, including members of the nonprofit museum’s Spy Board. Several representatives from AMU were also on hand to answer questions about the doctoral program. The goal of the evening was to encourage women to consider a career in cybersecurity or espionage. The four panelists were all former high-level CIA officers whose on-the-job stories ranged from comedic to poignant. Spy Board Member Jill Singer, Vice President of National Security at AT&T Global Public Sector, was the moderator. Dayna Baer, a former Protective Officer in the CIA Directorate of Operations, said her assignments abroad often involved supporting ongoing clandestine operations. To do that successfully meant blending in with the local population. “It’s easier for women to walk about without arousing suspicion than men,” she explained. On rare occasion, Baer’s often dangerous assignments contained an element of comedy. Baer and her partner were flown into Tuzla, Bosnia, as the fratricidal war in the Balkans was winding down. Their mission was to assist in protecting an important official who was targeted for assassination. They were dressed in all native-made clothing to hide their U.S. nationality. While driving toward their assigned destination, they suddenly confronted a checkpoint. It was a scary moment, Baer confessed, because their vehicle was loaded with cash and weapons. When a guard asked her partner for his papers, he inadvertently handed over his Virginia driver’s license. The guard read it slowly, wrote something down on his clipboard and handed him back the license along with a document he had written. Then he let them go. Once in the clear, Baer’s partner read what the guard had written on their permit. He told her, “On the first line, my name was ‘drivers’ and my last name was ‘license,’” Baer recounted, provoking a good laugh from the audience. Baer also admitted that not being able to talk about what she did can erode family relationships. Her CIA career created a split between her and her father that never completely healed, she said. Panelist Carol Rollie Flynn, a former CIA Station Chief, agreed with Baer. She said she lost her best friend when the friend learned of Flynn’s true occupation years later. The need for secrecy can erode trust and “is particularly hard on spouses,” she said. Former CIA Deputy Executive Director Carmen Middleton added that it was difficult to raise a family overseas. “You have to make sacrifices; you miss holidays and other occasions,” she said. But overall, living abroad can be a wonderful experience. Panelist Jonna Hiestand Mendez served as Chief of Disguise in the CIA’s Office of Technical Service. The OTS is the real-life equivalent of James Bond’s Q lab where the master spy’s wondrous gadgets and weaponized autos were fabricated. Mendez recalled how she once went to the White House wearing a mask that a colleague had given her. “I looked beautiful,” Mendez said. She was about take off the mask when President George H.W. Bush, a former CIA Director, told her to leave it on. He wanted to examine it closely. Finally, he told her she could remove it. The four panelists agreed that their careers provided outstanding experiences because of the unanimity of the agency’s devotion to its mission. Flynn said there were not many women in her entry class. They were “discriminated against as often as they were discriminated for,” she said. Flynn and her panel partners also agreed that the CIA has always been a welcoming employer for women. Middleton recalled that CIA’s founding director, Allen Dulles, formed “a petticoat panel” in the 1950s to address the concerns of the women employees. Following the panel discussion, the former CIA executives adjourned to a reception where they answered questions from the audience. Baer signed copies of her book, “The Company We Keep,” written with her husband Robert Baer, about their agency experiences. Mendez’s forthcoming book “The Moscow Rules,” details the lengths “the CIA had to go to operate in Moscow” during the Cold War. It is awaiting agency approval and is expected to be published in the spring of 2019.